One Omega Constellation collection of watches that has weathered the recent financial storm well is the de Luxe collection. Values overall have held up incredibly well, increasing around 15% over the past eighteen months. Released initially in 1952 and continuing in various forms until the advent of the third design phase, the Constellation de Luxe featured strikingly finished solid gold dials in a range of 18k cases. Click here for an essay on these luxury Omega Connies! Model 14393 shares the same case style as 14394 and also features de Luxe dial. 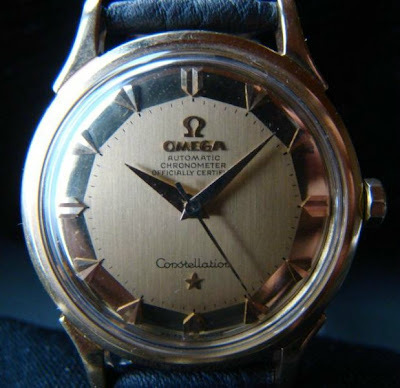 But according to Omega Vintage Watches Information website, it is only called "Constellation - Calendar". I wonder if it should be regarded as de Luxe model as well. Yes the difference between 14393 and 14394 is that the de Luxe model has an 18k solid dial whereas the deluxe dial on the 93 has a metal dial and deluxe 'furniture' - really meaning the gold index markers with the onyx inserts and gold hands. So, a de Luxe dial does not maketh a de Luxe model. Two main things I am a bit concerned about: the lettering of ‘Constellation’ and the length of the hands. Are they original? I suppose the dail is cleaned, but that is not a big issue for me. Hmm, is it the one on hold - ref. : omconstvint? If so, I would want to have a look at detailed pics of the inner caseback and movement. model, and I'm concerned about this dial that doesnt have the "officially certified" printed on the dial appearing in this particular case. One to go very carefulle assessing in my opinion. Cheers and good luck in your search. The watch has been fully serviced by Omega last July (Omega tells me they would not have serviced a Frankenwatch) with all the papers such a service concerns, included. Dealer does not want te open case, which I understand, just because of the service in July. Most likelt that the watch is a Marriage? In that case I will not buy. I dont know whether it is a marraige Willem, but there are questions about this watch and its compliance to factory specifications. For example, notice how the hand over-reach considerable the printed minute index....this should not happen. With the money you would have to outlay for this watch, you have every right to expect that it meets the standards of original Constellations. So I think you should keep looking until you find the perfect example. I have someone offering me a Constellation DE luxe, year 1954, Pie Pan model, all gold, even the pie pan dial, strap is croco,caliber354, it is in mint condition for $4,000 US, from what you said above, this is too much to pay for this watch, I don't know if you recently wrote your article, my question is simple, is this still to much to pay for such a watch? Hmm I think 4000 is more than I would want to pay for a cal 354 De Luxe. For example, recently I acquired a 2799 De Luxe for 2200 in good condition. Admittedly that was on the low side because of I bought it from a deceased estate, but I'm thinking that between 2800 and 3200 would be reasonable. If the watch was absolutely mint - sharp case, no patina, pristine movement and pristine case back - then I would pay 4k. 562 in a Constellation is problematic. While the Omega database has some cal 562 listed as chronometers, I have yet to see one that is fully genuine. It's better to try for a 561 or 564. O calibre 565 não foi um movimento cronômetro. eu tenho um 565 e na maquina diz:ajustado em 5 pocições e temperatura ,como isso e possivel? Provavelmente a "ponte rotor", que tem as letras "ajustado" foi trocada de um verdadeiro cronômetro.A descrição acima é a scanario mais provável. No entanto, a "ponte do trem", com o número de calibre poderia ter sido trocado porque foi danificado.De qualquer maneira, o relógio está incorreto. Desculpe. I think that I just might have inherrited and 168.014 in yellow gold with gold bracelets. What's the market price for such a piece? So many variables determine value of a specific watch: condition, model, movement etc. A good way to gain some idea is to view the completed listings on eBay to determine a ball park figure. Hi Desmond I inherited a vintage constellation from my dad that looks like a deluxe 561. Can you please take a look at it and tell me what you think? I sent pics to your email. I have a Constellation (circa 1960s) with a numerical face - is this rare as I haven't found any other Constellations that have a face with numbers? I'm assuming that the dial is a slightly domed dial with Arabic numerals marking each hour. Thank you for answering what was a mystery to me for the past week or so while I sifted through the web looking for guidance. Like Simon, I have a mid-60s Connie, mine with a Cal 564 movement and a BOR bracelet (#1069). Bought via eBay some 7-8 yrs ago from the UK but it only reclaimed my attention now. As I educated myself on markings to look for in authentic Constellations, I've been able to verify one after another. But the numeral dial puzzled me--because the few books I browsed, and the hours of searching out images on the web, didn't yield me a similar example to compare. I thought the dial might be a fake, or something really special. Hi Jeff, I've seen a few over the years, especially since I started looking for them. The dial was an offered variation by Omega, which, given the trends of the day and a preference for inlaid markers, wasn't a popular choice by jewellers and retailers to stock, or so I'm told. Thus they can be considered uncommon. I think people would pay a bit of a premium, but I'm not sure that the premium would exceed the premium collectors would pay for a good example of a pie pan in the same model. I guess only the market can determine that. I did a quick search on Google and came up with a couple of other examples.."Omega Constellation arabic numeral dial". The Seamaster 600 of the same period also had arabic numerals and is equally uncommon. Desmond, thanks again for furthering my Omega education. I'm baffled, but I tried the same web search (perhaps not in Google?) as late as a couple days ago--same words, different order--and didn't find the first number dial staring me in the face that I did this morning among the images! Go figure. In the end, I'm not sure whether I'm disappointed or relieved that this version of a Constellation dial may not be so special in market value... because I love having an excuse to keep wearing it. I could invent any number of excuses to keep wearing it Jeff :) In the 168.010 it would be equally uncommon, perhaps moreso. Hi, Desmond. I am new to the blog and recently aquired what appears to be a "British" Constellation for my husband as a 20th wedding anniversary gift. I would appreciate your assesment of this piece. I have posted photos on http://omegaforums.net/threads/best-watch-winder-for-1962-constellation.22149/#post-241154- I understand you are a respected member :-). I look forward to your feedback. Hi Kimberly, the case is excellent and the movement quite stunning and well-preserved. I have my doubts about the dial being original. But with such low resolution pics of the watch head on, it is very hard to make a definitive call. The issues I have with Swiss Made could simply be magnification caused by the crystal rim. The Constellation lettering looks a bit off to me particularly the last N and the a looks a bit fat in the pic. Star is not centred, but again I have seen original dials where the star has moved. A big pic taken in macro mode is the answer to the dial issue. Where are about below Helvetia markers font G,g and B factory or city? The small stamp below the Helvetia bust indicates the assay office where the case was taken to authenticate its gold content. For example "G" below the Helvetia indicates that the case was assayed at the Geneva assay office. Just found about this right after bought this Constellation on ebay. I posted thread in omega forum with puctures. What I like about the watch is that it has its original hidden crown and not a larger replacement and that's a plus. Nine row beads of rice bracelet was either purchased aftermarket or at point of sale, as bracelets were an add-on at the time the watch was produced. Bracelet separately is worth uyp to 300 USD but in my opinion its been polished a bit too much. Dial condition isn't bad at all, some minor patina but well within the range of acceptability. Movement has all of its signature parts. Some evidence of rotor scuffing indicating at some stage the rotor post or bearing was worn. You need to establish if the rotor was repaired. Also some small indications on the rim of the two rotor surfaces that it had scuffed the case back. Hands have either lume that has blackened or they have been replaced with hands with a black insert, which would match a different model that had black onyx inserts. Not a real biggie, but you would need to source a pair of hands with luminous material in the cut-out parts of the hands to bring up its originality. Case is sharp: nice crisp chamfer on the bezel and nice sharp edges to the lugs - a real plus. So, in my opinion, the watch head in the current market is worth around 900 USD and the bracelet separately up to 300 USD. I think you paid within the ballpark. I notice that some valuations on Omega forum are a little low at times, which indicates the money some collectors would personally outlay, but occasionally doesn't match with what the market is paying.